Viareggio takes its name after a latin name Via Regis (literally King's Road), the name of a road that was built in the Middle Ages along the coast and that still exists today. The city was built in the 16th century for the necessities of the Republic of Lucca for a seaside port. The territory on which Viareggio lies today was reclaimed from Pisans by the inhabitants of Lucca who conquered a secure land for commerce. 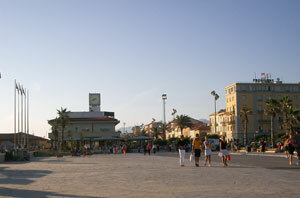 In 1601 the township of Viareggio was declared a "free port" and soon after became the chieftown of the coastal vicariate. The symbol and heart of Viareggio is the "Tower of Matilde". The first bathing establishments in town date back to 1823 and ever since they have been attracting visitors, many of them of historical importance such as the poet Percy B. Shelly, Lord Byron, Manzoni, Puccini and D'Annunzio. Elegant and very refined bathing Versilia resort, Viareggio (also called the “Pearl of the Tyrrhenian”), is a world-famous tourist destination. 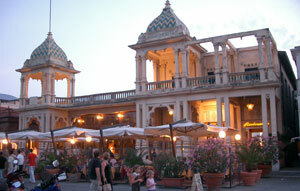 It is an entertainment centre, the country of the carnival (the Carnival of Viareggio, celebrated in January-February, during the period preceeding Easter) and of the Versilia nightlife (and to a more extended level, it could be also considered to represent the soul of Tuscan nightlife in general), with its high-level and fashionable clubs. 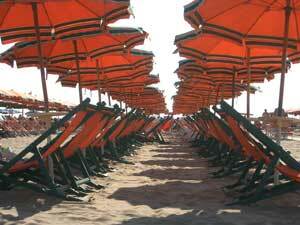 However, Viareggio is not only the nightlife but it also offers a stained and lively summer scenery with a vast array of peaceful activities for the all family, from May to October. (in June–July period), and the Puccini’s Opera Festival in the bordering Torre del Lago Puccini (another well–known bathing resort of Versilia), where the famous Italian opera's author Giacomo Puccini, lived for a period and composed many of his works. In Viareggio there are many buildings of architectonical interest, such as the Palazzo Bernardini ,built in the 18th century, the summer residence of some nobles of Lucca, the Palazzo Bell'uomini, which began famous for the fact that the Pope Pio 7th accommodated here before to be constricted to go to France like a prisoner of Napoleone 3rd, besides deserve to be noted also the Palazzo Paolina, built in honour of Paulina Bonaparte and nowadays seat of two museum and the Palazzo della Cittadella, on the site of which was built a prestigious hotel.